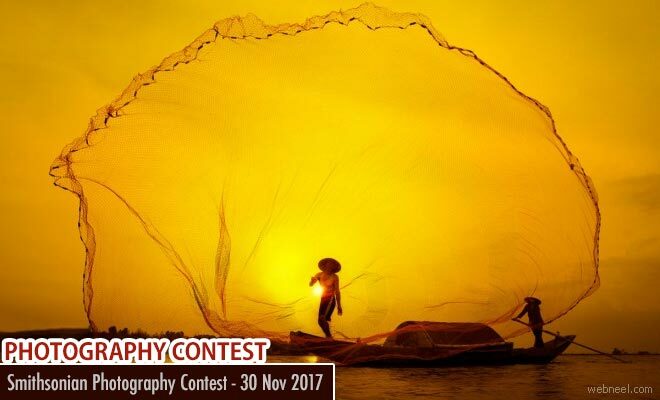 Smithsonian magazine organises photography contest anually to encourage and bring out the talented photographers around the world. The contest is open to all photographers who are above 18 years of age. The contestants can submit 15 photographs per category for a contest total of 90 submissions. The Smithsonian will select 10 finalists per category, a winner for each category and a Grand Prize winner from the 60 finalists. The 60 finalists will be announced in the website by spring 2018. Natural World : Animals, plants and landscapes; geological or climatological features; and scientific processes and endeavors. Travel : Locales, peoples or activities in the United States and abroad that convey a sense of place. People : Portraits and photos of groups or individuals. The American Experience : Events, objects or activities connecting the American people to their history or their cultural heritage; photographs that tell us what it means to be an American and provide a sense of what it is like to live in this country. Altered Images : Photographs manipulated for artistic purposes by applying digital and/or traditional special effects (i.e., colorizing, toning, collage, photo composites, HDR, etc.). Mobile : Any photograph taken with a mobile device (phone or tablet). Readers' Choice: The winner of the online Readers’ Choice award will receive $500.